There is an old saying a good doctor treats a sick person but the best doctor treats a person before they get sick. This means that prevention is the most effective way to health. In the old days of China a doctor would be paid to look after a village and if people got sick then they would get treatment free of charge. It was like an insurance system where it was in the doctors interest to keep his patients healthy. In this old system if people came in for 'tune-ups' and followed simple diet advice, the doctor would keep the community happy and productive with relative ease. In the spirit of this ancient system, today's acupuncture treatments in can take the place of these 'tune-ups'. Acupuncture can help balance subtle disharmonies before they snowball into obvious medical problems. Four treatments a year – at the change of the seasons – combined with the advice below is one way you can maintain a healthy life for years to come. The early Chinese – similar to our modern aging population – were obsessed with longevity. They found that health could be understood as substances that could be cultivated, accumulated and preserved. They called these substances of health the three treasures. Accumulating these treasures is not complicated if basic principles are followed daily. There is no real secret to being fit and active even into your 90's it is simple common sense and a little bit of daily discipline. Opening and purifying the mind and strengthening the spirit through consistent awareness practices is the most effective way to strengthen the body. Without mental growth the body too will become stagnant. In the modern day information age we can become fragmented mentally, distracted, making it difficult to maintain any kind of diet or exercise regime. It is now more important than ever to develop a personal internal practice. A practice can be anything that on a daily level develops peace of mind patience and moderation. Use this quiet time to guide you in your life and make important decisions while calm focused and relaxed. Any diet of exercise program will be short lived in its effects without a spiritual foundation of some sort. This aspect gives the focus and power for true healing to occur and the will power to maintain any health regime. 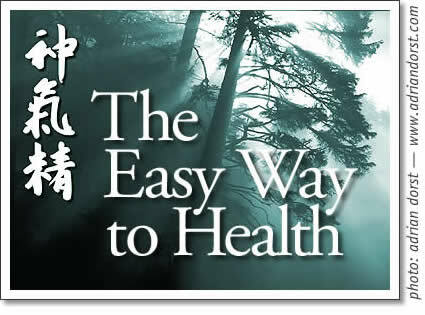 To circulate Qi exercise is good when Qi moves we feel alive and energized even euphoric. This is good, but to Build Qi one must exercise with an awareness component. Examples of this combination are yoga, Taichi, any activity is fine, it should be appropriate to your level, not excessive, but balanced and disciplined. Work and rest must also be balanced. The best exercises are ones that allow one to develop a mind body connection. The most obvious ones are taichi, qi kung (Chinese Yoga) or meditative walking. Any activity is fine even running as long as an awareness development component is included. Remember to be active regularly or everyday if possible. Get to the point where you are not saying "Am I going to exercise today?" but "When am I going to exercise today?" You don't have to be training for a marathon but a daily walk where you get the heart rate up is good for a maintenance level of health. What you eat is important but also how you eat is equally important. One should eat in a calm state of mind, sitting down with family or friends at regular times. Train yourself to appreciate every bite and chew your food. The idea of grace before meals is a good one because it trains one to appreciate the food. This state of appreciation is a healing state that has been found to regulate the autonomic nervous system and thus the digestive process. Do not overeat – it is better to have small frequent meals. The exception is breakfast – always try to eat a large healthy and hot breakfast. This builds the body and the metabolism and you will actually lose weight this way. Taper off the size of meal you eat towards the end of the day. "Breakfast like a King, Lunch like a prince and dinner like a pauper." When cooking fresh food, don't overcook! Steam vegetables not to destroy their nutrients. Building your treasures with proper food. When deciding what food is to eat there are many systems. The simplest way is to ask yourself what would you be eating if you were growing your own food. Eating local seasonal food is the healthiest and easiest way to build and maintain health. If you look at the many diet systems and you will find this is actually what they are based on. Fresh foods promote tryptophan, serotonin and melatonin, which produce deep sleep and calmness. This directly effects immunity and mental stability. Another reason to think globally and act locally.